A new study sheds light on the rarely observed habits of these nocturnal creatures, which dig large burrows that they leave after just two nights. 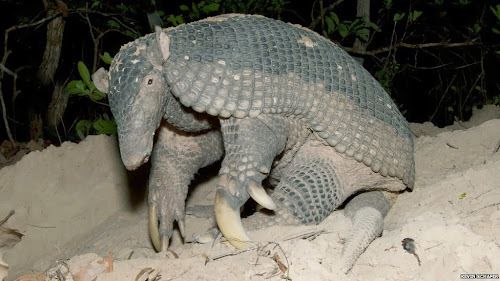 Like phantoms of the Amazon, giant armadillos are barely known and rarely seen, as they dig deep burrows to hide themselves during the day and only come out at night. Growing up to 5 feet (1.5 meters) long from snout to tail, these armadillos are always on the move, and generally only stay in their 16-foot-deep (5 m) holes for two nights before excavating new ones. New research shows that these burrows are surprisingly important for other animal communities in the area and provide shelter for at least 25 other species, from tortoises to lesser anteaters. "Giant armadillos are like 'ecosystem engineers,' providing homes for many other animals," said Arnaud Desbiez, a conservation officer with The Royal Zoological Society of Scotland who is based in southwestern Brazil's Pantanal, the world's largest freshwater wetland, where the study was conducted.